The internet is full of the most adorable ideas on how to decorate anything and everything. DIY (do-it-yourself) crafts are all the rage, and everyone seems to have a new twist on an old favorite. Seriously, if someone ever locks me in a Hobby Lobby, and I will never be bored or run out of Pinterest crafts to create! In true blogger fashion, I'd like to share one of my own simple, inexpensive, yet fully customizable DIY crafts that you can still get in before Christmas! The beautiful part? I can almost guarantee that you have everything you need to do this floating around your house right now. A lot of bloggers make that promise when introducing a craft, but wait until you actually see how brilliantly easy this is, you will totally thank me! 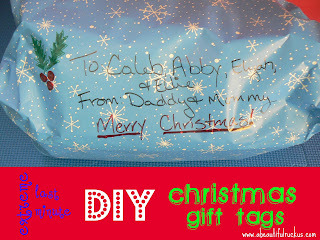 Today, we are looking at creating the perfect last minute Christmas gift tags for your gifts. It is so easy, you won't even need a template. In fact, I'm not even going to give you one, because I want you to feel free to use your imagination and creative genius here. The first step is pretty self-explanatory. Wrap your gift. Not much to it. 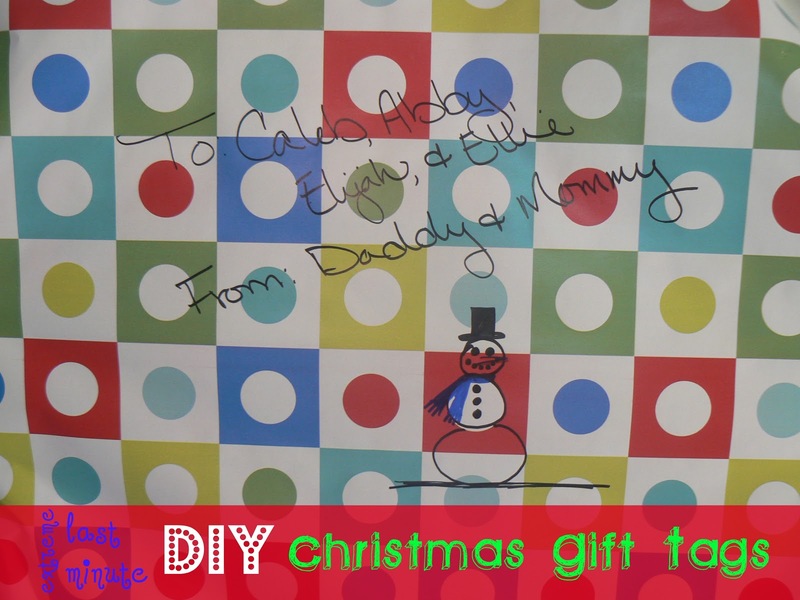 Now for the fun part, grab your sharpies and write directly on the wrapping paper to label the recipient and giver. I know, I just blew your mind right?? If you are really into the Christmas spirit, add some mistletoe or a snowman. And that's it, folks! An awesome DIY Christmas Gift Tag that you don't even have to get your printer out for! I like to tell my parents and my husband's parents that I've done my part in supplying them with grandkids. I now feel like I've done my part by contributing my own DIY craft to the blogsphere. I also created a "pinnable" image (see the first photo) if you would like to share the simplicity and creativeness of this craft on Pinterest! Invisible gift tags - best idea ever! Hahah! We've done that for years :) Its fun to try & hide the name somewhere in the pattern of the paper (especially as the kids get older & try to figure out to whom each present belongs). Ooo! 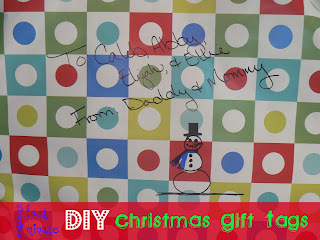 I like the idea of hiding the names in the wrapping paper! I might start that in the future when they learn to recognize their names. Thanks for the idea! This is how we've always done it lol, I've felt so lazy all these years :D If I ever have wrapping paper that is too dark/patterned to see the writing I just cut out a square of wrapping paper and write on the blank back and tape that to it. Every year I promise I'll buy gift tags, but I never do. Hehe! I've done the square of wrapping paper too, but at this point, I'm too lazy even for that. If necessary, I go over the letters a few times with a sharpie and hope it's enough! This pleases me. I think even I can be this crafty! Love it! I have finally printed tags this year ;) Have a beautiful Christmas!!!! Hehe! Thanks for commenting, Michelle! It sounds like you are way ahead of me with the printed tags! Merry Christmas to you too! That is exactly why I don't spend a lot of time wrapping either...it's just going to be thrown away. I do appreciate a really nicely wrapped gift for an adult, but for my toddlers? Sharpies it is! Nice to know I'm not the only one who thinks this is the normal way!